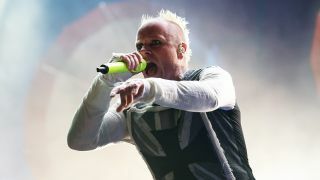 The Prodigy have called on fans to line Keith Flint’s funeral procession route this Friday (March 29). The singer died by suicide at the age of 49 earlier this month and there will be a memorial service for him at St Mary's church in Bocking, Essex, on Friday afternoon. The band have posted a map of the route on Twitter and say: “Fans are invited to line the procession route, starting at 3pm in Braintree, Essex, on Friday, March 29, to pay their final respects and 'raise the roof' for Keef! Toxicology reports relating to Flint's death are still to be filed, with a full hearing due to take place on July 23. The Prodigy formed in 1990, with Flint originally brought in as a dancer. But in 1996, he took over on the mic for The Prodigy classic Firestarter and then appeared on the follow-up single Breathe. Both tracks featured on the the band’s 1997 album The Fat Of The Land, with Flint also lending his vocals to Serial Thrilla and Fuel My Fire. Flint went on to appear on The Prodigy’s 2004 album Always Outnumbered, Never Outgunned, 2009’s Invaders Must Die, 2015’s The Day Is My Enemy and 2018’s No Tourists.